Fully tested with Divi and Extra (including V3.01+) so you can inject your saved layouts throughout your website. 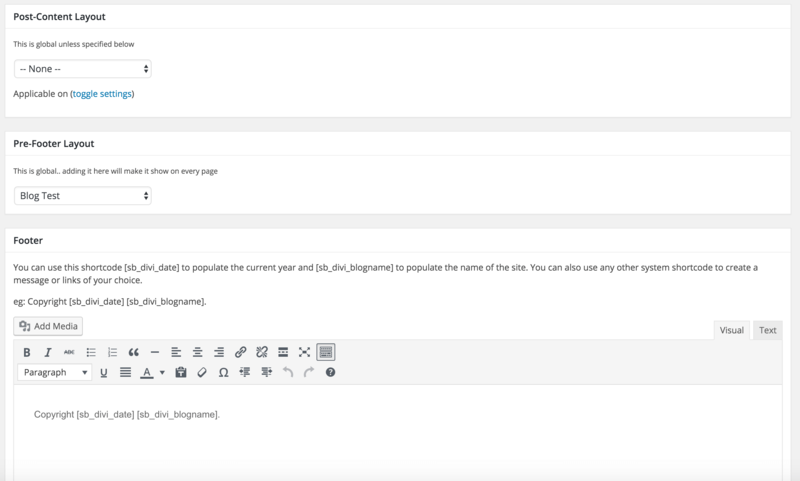 Take a look at this great review on Elegant Themes and see what you can do with this very powerful plugin. In short, the original Divi layout Injector lets you use your library layouts at a variety of points on your website (top, bottom, widget etc..) on a global scale. It’s theEssential page builder everywhere for your site! This game-changing plugin allows you to place saved layouts onto ANY page on your site centrally in a variety of positions on the page. We call them injection points but they relate to ‘pre-header’, ‘post-menu’, ‘pre-content’, ‘post content’ and ‘pre footer’ areas. Creating the layout ONCE only and then using a simple and central admin system to add the new layouts to the site in different “injection points”. There’s also a default 404 Layout Injector which allows you to customize your 404 pages optionally based on a page (redirect) or just by overriding the 404 layouts directly as well as a great little WYSIWYG footer editor too. 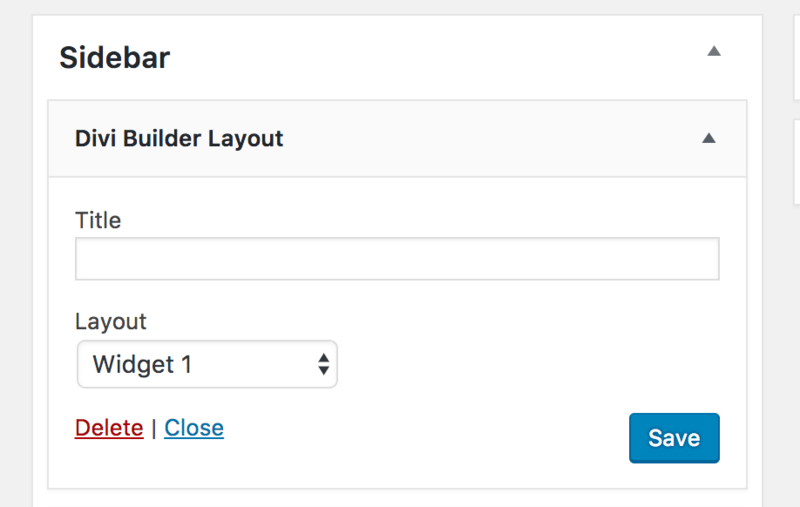 In addition to all of that, you’ll be pleased to hear that you can now use the Divi builder to power Widgets. Simply create a layout and then add the widget to any sidebar and choose your layout to use. Bringing the power of the Divi Builder to sidebars as well! All in one plugin – Incredible!, no coding, no importing of XML files, no conflicts, tested with DIVI 3.01+ And Extra with all the usual plugins and it works like a charm. Watch the video to see how it works. (old video, new functionality added and a better settings page added). I have a lot of php errors “Illegal string offset ‘sb_divi_fe_pre-header’ ! Please upgrade PHP to at least 7 and if the issue persists, please go to the product page and ask for support. Hi Fulvio – did you get an answer from Sean? I’m getting loads of error message like this as well. And I’m on php 7.2. Sorry to bother you, but I haven’t had much of a response from support. Could anyone confirm that this plugin will work on WooCommerce headers as well as Divi based Pages/posts etc? As I am getting reverse display in headers. So in Divi pages/posts i get the order I want the injected header then menu, but on WooCOmmerce Category and Product pages I get the menu then the header. I have an open ticket for this since a couple of months but I’m getting tired of replies where handing out admin login credentials is the only solution. Cause it is NOT. Would be great if someone could offer some help. The 404 layout has some issues. I’ve set a up a brand new WP install with Divi theme and Extra/Layout Injector is the only plugin installed to eliminate questions of conflicting plugins. I’ve set up a 404 layout. When the layout is used in a page and page is selected as 404 layout everything works fine. But when layout is selected and the same layout is used markup is not so pretty. In my layout I have a search box. This is rendered nicely on a page but as a layout on a 404 the div that holds the is injected with a bunch of and and also the has a style of height: 122px added for some strange reason. It seems like the issue with injected has been reported and fixed it within the CPT injector. Any solution or possible workaround would be appreciated. Or at least some kind of acknowledgement that plugin is broken. a presales question: Can I replace the normal footer with the plugin? I only see pre- and post-footer options. I want to make it a revealing footer afterwards, but that wont be a problem I guess. At the moment we can’t completely remove it but it’s easy enough using CSS and I’ll add it in a future version also.. I want post navigation after every post, but don’t want to have to add the divi post-navigation module individually to every post. Does layout injector solve that? When will this be fixed so that the pre-header works properly on Extra archive pages built with the category builder? At the moment, the pre-header layout is displayed differently on category builder pages – additional/incorrect padding, row/column layout not working (flex issues), font sizes/styles not being applied correctly (login module), etc. Using the latest version (3.1). Can this plugin take a Divi layout (full width header) and place it on an Extra category layout? And/or can it take an Extra layout (posts carousel) and place it in a Divi layout? It seems it can, but I don’t see it spelled out anywhere. I get a License NOT Active and I can’t download anymore. We have fixed this for you. No problem with other injects. Anyone has a solution ? Hi Francois, This has now been rectified in V2.8. Grab the latest version and it should now be fine. Do let me know if you come across any more issues. In my dash board the license Expired and i cannot download it any more. When i use a download file i already have and try to activate with the key i already have say License NOT Active. Can i use it with no problem? We have corrected this issue for you. * The Plugin “” needs an upgrade ( -> 2.7). * The Plugin “” needs an upgrade ( -> 2.4). There was a licensing issue. Please log in to your account as we have renewed your lifetime license. You may have to download the latest versions and reinstall. They will auto update from now. Either connect with http://docs.tortoise-it.co.uk/ for help or set up a divi library item like a full width header or text module with your video link or code and inject into the header. PLease note, embedded video will not play on mobile where a youtube or vimeo iframe code will. I have Divi and used it to design my new webpage. However, I also have another plugin for something else i need, but when I make a page with that plugin Divi is not available. I was hoping to make this page look more like the others. Will this editor allow me to add the Divi Layouts I have saved onto this page? It looks as though the plugin you are using does not allow the divi builder to load on it. Please refer to that plugins support or documentation. Can anyone (including Sean) mention how this compares to the Page Builder Everywhere plugin? Are both similar? Does one have more features? Great plugin, solves a lot problems. Do we get automattic updates ? The pre-header is not working for me, it shows after the header (main menu) and it suppose to go over the menu. Hi, I am building a website on localhost using layout injector and would appreciate understanding how to transfer the layouts to the live site. Normally I would upload the entire site and database but in this case I just need the layouts to be transferred. Hi Andy, its as easy as saving down the layouts using the portability system. So, once you have designed your layouts. Export them and then upload to your divi library. 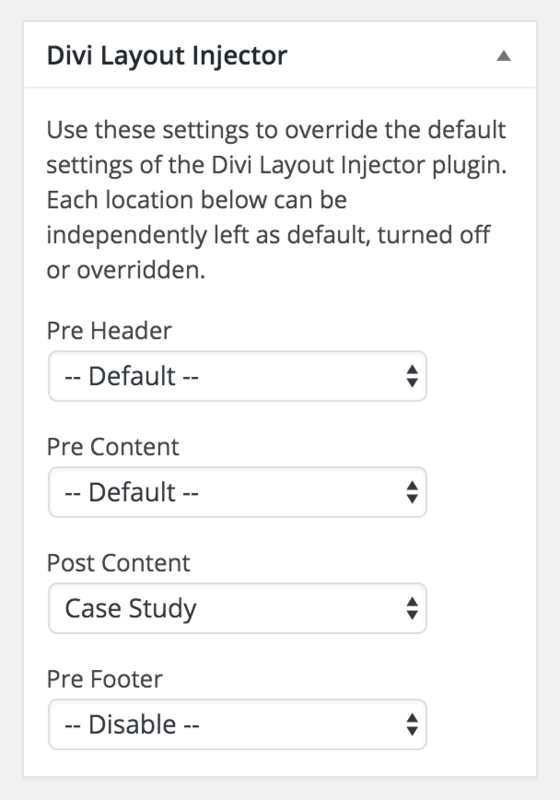 Then, use the divi layout injector settings in the site to select and choose where they appear. If I want to replace the header and footer in Extra theme then this will do it? I normally use Divi with blank page template but sometimes extra is better. Yes, this plugin does work with Extra. Can I use this on other ET themes like Foxy with the Divi Builder plugin? I bought this plugin and also the bundle with all the injectors. It is working well on my divi-powered websites. However I have a website I use Extra for and the pre-footer just won’t show up. Could you please help me troubleshoot the issue through email? Hi Pierre, This has now been rectified in V2.8. Grab the latest version and it should now be fine. Do let me know if you come across any more issues. Hi Pascal, the header insertion will not work if Fixed menu is enabled. So, please go to dvi>options and disable the fixed header and all will be good. I´m working on the EXTRA Theme. THis theme includes Category Builder which offers NEW and GREAT modules with the ones you can create Category Layouts. However, this layouts can NOT directly been applied to Pages. 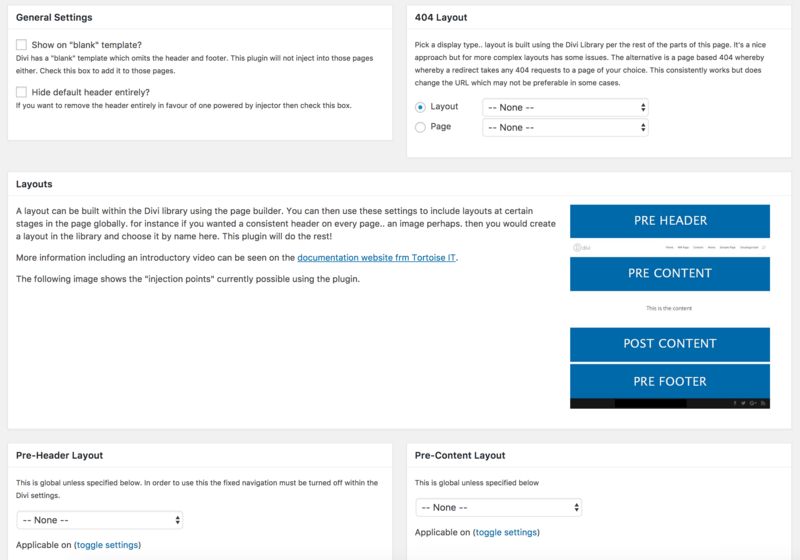 You have to build a layout in the Category Builder and then, somehow, apply to Homepage but it´s not very flexible : ( since I would like to be able to use these extra modules, mainly: Blog Feed Masonry, Featured Posts Slider, freely on any page. 1. with this Injector Plugin, could I build a Layout in this Extra Category Builder and SAVE it to LOAD it and USE it on any page? 2. Is there a way to use all those extra modules right on the main Divi Builder wiithin any page? I install this plugin on every site. It allows me to easily do creative layouts (especially headers/menus) and is infinitely versatile and easy to use. What a time saver! Love it! Hi, when the Plugin is activated, menu and footer disappear. Is there a setting, I have overseen, to turn them back on? I tried with a support ticket, but as I didn’t get any notification mail for registration neither for ticket submission, I guess I will never see the answer there. Hi, I found out it was another plugin that did hide the menu. Hey Josh – I finally figured out a workaround for my site with this problem. If I “injected” a layout it caused extra white space. Instead, I saved the section I wanted to inject as a module and used that instead and it eliminated the extra white space. Hi. The plugin is very cool, but each time I use it to insert a footer in all my pages, each time I resave the layout line breaks are stripped. I got this problem on each site I’m using the plugin. I always have to ask a dev to find a fix in theme and of course, I have to pay each time so plugin is becoming rather expensive to use. Is there a real solution for this? This may be associated with Divi or WordPress more than the plugin. Try installing tinymce advanced as that can help avoid line breaks in text modules. hi again if I would like to make 3 sections global can I do this If I save all 3 to library? Having same issue as others with post-content layouts not showing up. I’ll message you. Hello, custom header is not showing on category pages. Is that right???? Can I use a layout section above footer only for posts? Hi Syed, yes you can indeed. There is a filter in the settings allowing just that. I’ve just bought this plugin and am testing some of the functions. When adding a pre-footer layout it breaks the footer. Can this be fixed please? Thanks for letting us know. If you please drop me an email with a login to your site I’ll confirm your settings and get some feedback your way. I’m trying to use the plugin with the Post-Content option. But it does not show the assigned Divi Layout. Works fine with every other option like Pre Content. Thanks for this. Can you please drop me an email with a login to your site and I’ll check it out for you. How or where can I email you? This is a fantastic easy to use plugin. I had a query and contacted Sean who responded back within the hour with a solution and fix. I would definitely recommend this plugin for its functionality first class customer service from the developer. I would like to know if by using this plugin, I would be able to use my pages template as for my posts. I would like to get rid of Divi default header as it cannot be customized for posts. Is this possible? Yes, you can use a separate header for posts using this plugin. There are also various settings for choosing the page location of the header. I.E home page etc. i found your plugin and i wanted to ask if it is possible to show the top bar only when a button is clicked. I just got your layout injector. However I run into problems when trying to set a layout for custom taxonomies layouts in a child theme based on Extra. I defined an Extra layout, set it as default for the specific custom taxonomy and basically it is working. However I found no way to tell it I want to have the sidebar displayed plus the standard Tax:Term header is missing. Am I doing something wrong here? Just wondering if you are commenting on the right product page or if this is unrelated. 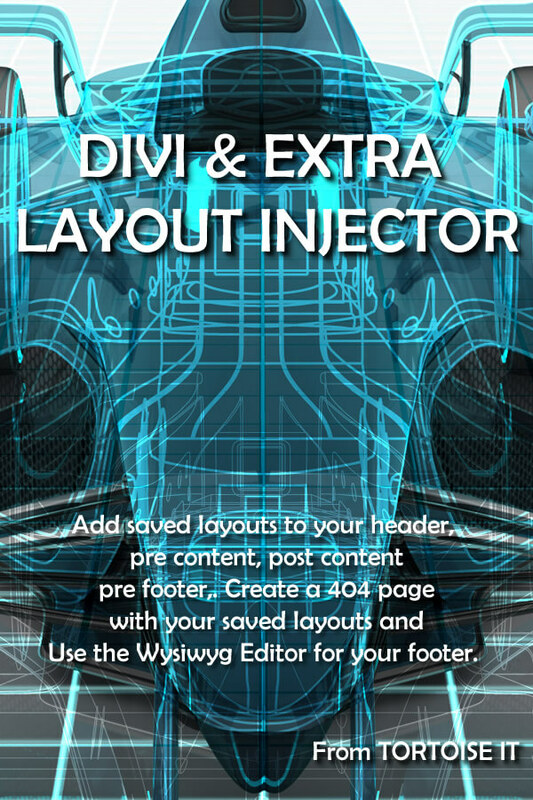 Divi Layout Injector allows you to, as it’s most basic level, top and tail pages with layouts you create. These layouts aren’t subject to any Divi or Extra based sidebar settings are they sit above or below them. If you bought Taxonomy Injector which is designed for taxonomy pages then this may help if you’re looking to override the entire page. Hi – I purchased layout injector. Can I use layout injector to create 3 custom headers – one for desktop, one for tablets and one for phone? If so, how do I reference them in my CSS? I am pretty sure tht you can choose whether to apply the layouts in there own section on mobile, tablet and desktop. If that does not work, you may need to use specific id’s in your code to display each relevant section. Hello! We bought the Plugin, yet we are experiencing some Performance Problems as well as a CSS Problem when using woocommerce. Is there a way to get Support? Hi!! wondering if the layout injector will solve my problems 🙂 im THE least tech – able pwrson i know. divi’s nav menu hamburgers on mobile, and I asked et support how to stop this and they said “you can’t”. I’m wondering if I could build a menu with image modules and links, and inject it -it should appear on category pages also yes? If I can’t get a full menu on my site above the posts on mobile I’m going to have to leave divi which is breaking my heart a little. Burger menus are pretty normal these days. The easiest way to make a menu without though would be to use the layout injector, build a custom header to replace the one that’s there and use the custom menu widget or something to show the menu at the top. This plugin will add your header module globally, as with all software – the returns policy is such that if it really does not work on your installation a refund will be offered. We’re working on auto updates. Should be around within the next month as we are renewing the infrastructure. This will take place across all EMP products including this one. Hey Fatima, to get pre-header to work you need to disabled the fixed navigation in the divi settings. It should work fine then. We are surprised by this as the injector is a very light plugin. Could you tell us which version you are on and we can take a look at this for you. As with all plugins, there may be a slight conflict with something you are running on your particular installation.